A rainy weekend is coming YEY !! Yes we know, we shouldn’t be that excited… but for us, on a rainy day, there is only one thing to do, stay warm (with a fluffy and warm blanket or in a hot bath filled with rose nurturing essence… Or we also have the perfect recipe! A naturally nourishing colourful Beef Pho ! Don’t worry it’s not as hard as it sounds! A Pho is a traditional Vietnamese soup infused with aromatic herbs & spices. At Hart and Soul, we created this wholesome recipe with low calorie Konjac noodles & sliced beef to nourish your soul and make you enjoy the goodness of real ingredients. 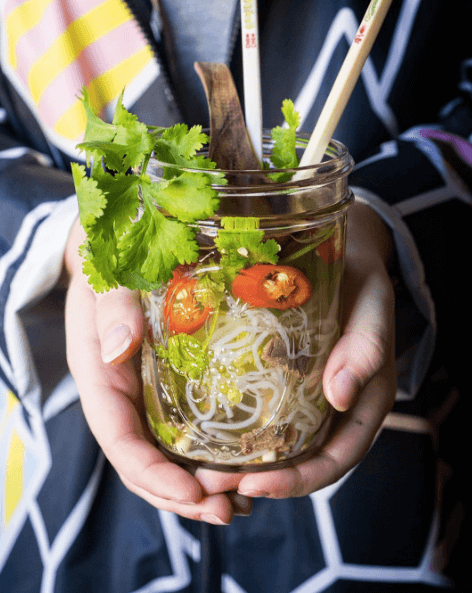 Shana Paige from the @thebalancedkitchen has shared with us her Pho creation. Shana is a talented young woman who like us, as a passion for real ingredients and nutritious food. She simply (and deliciously) adda few fresh accompaniments to our Hart & Soul Pho Cup to create a colourful and absolutely charming recipe. Super easy and super yummy (we promise), if you like quick and easy meal, you must try it ! Gluten Free. Dairy Free. 100% Natural. GMO Free. Made with New Zealand Beef, this little jar of yumminess will take you to cloud nine at the first spoon.